Erbil, Kurdistan Region, Iraq (cabinet.gov.krd) – Prime Minister Nechirvan Barzani welcomed the first Kingdom of Saudi Arabia, KSA, Consul General to Erbil, Dr. Abdul-Mun’im Abdul-Rahman Mahmud. Consul General Mahmud thanked Prime Minister Barzani and Kurdistan Regional Government, KRG, departments for their assistance in establishing the consulate general, expressing his hope that it would become an active bridge between the KSA and the KRG. He praised the role of the Peshmerga forces in the fight against terrorism, stressing they are worthy of full international support. He also affirmed Saudi Arabia’s commitment to provide assistance to the Iraqi internally displaced persons who sought refuge in Kurdistan Region. He stated that the consulate general will give priority to encouraging businessmen from Saudi Arabia to invest in Kurdistan and strengthen trade relations. Prime Minister Barzani congratulated Consul General Mahmud on his appointment and opening of the consulate general. He stated that opportunities to invest in Kurdistan are open to Saudi investors, especially in the industry, tourism, and agriculture sectors, and invited them to participate in the building of the Kurdistan Region’s economic infrastructure. 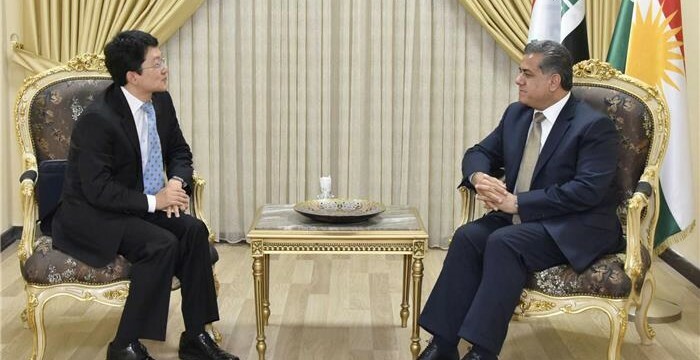 Erbil, Kurdistan Region (dfr.gov.krd) – Head of KRG Foreign Relations, Minister Falah Mustafa today received the new Head of EU Delegation to Iraq, Ambassador Patrick Simonnet, to discuss recent vents. 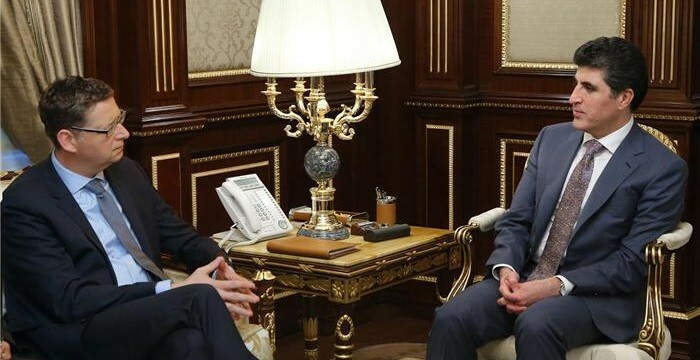 Ambassador Simonnet expressed delight at visiting the Kurdistan Region for the first time, and said that the purpose of his visit was to meet the KRG leadership to discuss the ongoing challenges facing Iraq and Kurdistan Region. “We view EU as a partner. We call upon EU to provide technical assistance to help KRG overcome the current challenges and to help us strengthen the institutions of the Kurdistan Region,” Minister Mustafa added. Both sides also spoke in detail of Erbil-Baghdad ties and the future of the Kurdistan Region. Deputy Head of EU Delegation Mr. Konstantinos Vardakis, Mr. Patrick Geysen Head of EU Liaison Office in Erbil, and Assistant Head of DFR Ms. Siham Mamand also attended the meeting. Erbil, Kurdistan Region (dfr.gov.krd) – Head of KRG Foreign Relations, Minister Falah Mustafa, today welcomed the new Head of Embassy Office of the Republic of Korea, Mr. Young-Kyu Park. On behalf of the KRG, Minister Mustafa congratulated Mr. Park on his new post and assured him of the DFR’s full support to ensure the success of his mission. The Minister stated that the Korean Embassy Office and the Korea International Cooperation Agency (KOICA) continue to play a key role in furthering relations between the Republic of Korea and Kurdistan. Head of the Korean Embassy Office said that he was very pleased to be posted to Kurdistan Region and expressed commitment to build upon existing cooperation between Korea and Kurdistan Region. “Please allow me to express my full appreciation for the sacrifices of the Peshmerga forces in the global fight against ISIS and for the welcoming attitude of the KRG towards displaced people and refugees,” Mr. Park added. Both sides discussed ways of enhancing bilateral ties as well as the multiple challenges facing the Kurdistan Region. Erbil, Kurdistan Region, Iraq (cabinet.gov.krd) – In a statement today, the Kurdistan Region Security Council, KRSC, said that Special Forces from the Directorate General of Counter Terrorism, CTD, part and parcel of the KRSC, rescued a young Swedish woman near ISIL-occupied Mosul on 17 February 2016. “The Kurdistan Region Security Council was called upon by Swedish authorities and members of her family to assist in locating and rescuing her from ISIL. “She is currently in the Kurdistan Region and is provided the care afforded to her under international law. She will be transferred to Swedish authorities to return home once necessary arrangements are put place”, said the statement. Erbil, Kurdistan Region, Iraq (cabinet.gov.krd) – Prime Minister Nechirvan Barzani condemned the terrorist attack that targeted the Turkish capital, Ankara, on 17 February 2016. In a telephone conversation yesterday with Turkish Prime Minister, Ahmet Davutoglu, Prime Minister Barzani expressed condolences to the families of the victims and to the government and people of Turkey, and wished prompt recovery of the injured. Prime Minister Barzani and Prime Minister Davutoglu stressed the need to strengthen anti-terrorism efforts and reinforce cooperation among the international coalition in order to erradicate terrorism as a threat to the region and the world. Kurdistan Region President Masoud Barzani participated in the annual Munich Security Conference. In the first day of the conference, the President held meetings with King Abdullah of Jordan, Iraqi Prime Minister Abadi, Lebanese Prime Minister Salam, Macedonian President Ivanov, UK Foreign Secretary Hammond, German Foreign Minister Steinmeier, Egyptian Foreign Minister Shukri, EU’s Foreign Policy Chief Mogherini, Turkish Foreign Minister Çavuşoğlu, Iranian Foreign Minister Zarif, Italian Foreign Minister Gentiloni, French Defence Minister Le Drian, and other officials from around the world. In his meetings with world leaders at the conference, the President reviewed the campaign against the ISIS terrorists group, the political and security challenges facing Iraq and Syria, the financial crisis facing the KRG, and the issue of referendum in Kurdistan. The meeting between the President and the Iraqi Prime Minister focused on the latest security and political developments in the country, and Erbil-Baghdad relations. They both emphasized the need for continued dialogue between the two sides. During the three-day conference, the President will speak at a special panel on the security situation in the Middle East and the threat of ISIS to peace and stability in the region. Erbil, Kurdistan Region, Iraq (cabinet.gov.krd) – In a cabinet meeting yesterday, the Kurdistan Regional Government discussed a set of measures to address the current financial crisis, facing the Kurdistan Region. The cabinet agreed to implement a specific set of measures of reform to reduce costs while having the least possible impact on the citizens. In a press conference held following the meeting, the KRG Spokesperson Safeen Dizayee and the Council of Ministers Secretary Amanj Rahim announced the reforms. The measures include implementation of a fair system of savings of a designated percentage of all governmental salaries and bonuses, excluding Peshmerga, Security and other special forces. This will enable regular and timely payment of public employees’ salaries. The amounts will be saved and owed by the Ministry of Finance and Economy as of first of January, 2016 and will remain along with the outstanding amounts from 2015 until a time when the situation is normalised. All repayments of citizens’ loans to the government will be suspended. The measures also include formation of a committee to supervise all oil and gas revenue accounts and the entire oil and gas processes, with assistance of an international financial auditing company with the aim to separate the financial areas of the oil and gas sector from the Ministry of Natural Resources until the establishment of the Board of Oil and Gas Income. The Committee comprises members from the Board of Supreme Audit, the Secretariat of Region’s Council for Oil and Gas, the Ministry of Finance and Economy and the Ministry of Natural Resources. It was also decided that all sales, purchase and exchange processes of crude oil and its refined products, aside from the crude oil which is exported through Kurdistan’s pipelines, will be done through public bidding and open tendering to provide equal opportunities to all companies and contractors for the best price at the highest quality without favour or preference. The Ministry of Natural Resources is required to prepare and begin implementing new regulations to this effect within 30 days and the process with be audited by the Board of Supreme Audit. The relevant Ministries, Governorates and Mayors, in coordination with Chambers of Commerce and Market Supervisory Councils, are requested to supervise the price of daily goods and services to balance price with the income of the general public, in particular food prices, health services, property rent, private schools and nurseries, Internet services and electricity, including private generators. For this purpose, the Council of Ministers has delegated authority to the relevant Ministries and Governorates. These measures are part of the KRG’s ongoing efforts to address the financial crisis, which has created a huge imbalance between expenditure and income in the Region’s budget, caused by Baghdad’s withholding of Kurdistan’s share from the Federal Budget since February 2014, the war against the Islamic State terrorist group, ISIS, the influx of a large number of refugees and internally displaced persons and the recent sharp fall in the oil price. Erbil, Kurdistan Region, Iraq (cabinet.gov.krd) – In a meeting held yesterday, Deputy Prime Minister, Qubad Talabani, briefed foreign diplomats and representatives about the current financial crisis in the Kurdistan Region. He explained the financial situation of the Kurdistan Regional Government and the measures that the government has planned to take to address the crisis. Deputy Prime Minister Talabani also pointed to the recent KRG delegation visit to Baghdad and the talks held with Iraqi Prime Minister and other Iraqi senior officials. The latest developments in the fight against the Islamic State terrorist organisation, ISIS, were also highlighted in the meeting. Deputy Prime Minister Talabani expressed his and Kurdistan Region people’s gratitude to those countries, which offered assistance in the fight against ISIS and in accommodating a large number of refugees and internally displaced person who took refuge in KurdistanRegion.